These great value bin liners are designed to fit bins of up to 60 litres, measuring 126cm around the rim and around 95cm in length. 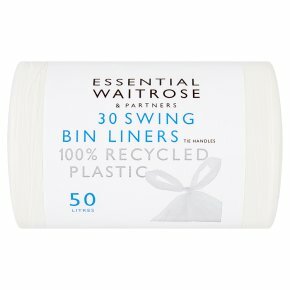 The bags incorporate handy tie handles for added convenience and come with all the quality you'd expect from Waitrose. Safety First:To avoid danger of suffocation keep this bag away from babies and small children. Allow hot refuse to cool fully before placing in the liners.. Glass and sharp objects must be wrapped securely before placing in the liners.